Disclaimer: The views expressed and the conclusions drawn in this research report do not necessarily reflect the views of the supervisor. Every effort has been made to ensure dissemination of correct information only; however, supervisor does not accept any responsibility for possible errors and omissions, if any. The supervisor has only advised the researcher on how to progress in his/her own line of thinking. The verse under consideration can be divided into two parts. There prevails much more confusion about understanding of the first part as compared to the understanding of the second part although both equally influence the understanding of the verse. 1. The phrase “people of the Book” refers to whom? 2. The phrase “believe in” refers to what? 3. The phrase “death of” refers to whom? 4. The phrase “witness” refers to whom or what? The answers of these questions not only have a substantial effect on the exegesis but the simple translation as well and hence represent a variety of meanings and ideas. We start our search for the answers of these questions from a brief review of available literature on the meaning of the verse under consideration. In our quest, we go through some of the early tafaseer of Quran and some of the contemporary as well, without any sectarian discrimination. The selection of tafaseer is mainly influenced by the online availability issue but whatever was available has not been included. The selection of tafaseer has been made keeping two factors in view; to encompass as many differing opinions as possible in this scarce space and the respect/acceptance they (both tafaseer and their authors) command in the Muslim community. We also try to figure out the basis of the explanations presented in these tafaseer. In section 3 we discuss difficulties faced in the understanding of the verse and also present our view on the issue. Finally some conclusions are presented in the last section and future work in this regard is also suggested. First let us see what has been said about this verse by our scholars of the past and the present. In the light of excerpts from selected tafaseer, we would attempt to find out the answers of the same questions raised in the previous section, and also analyze the way these scholars have answered these questions. Here the phrase “people of the Book” refers to “all Jews and Christians” without any discrimination of time and age. Subsequently, it attributes both, “believe in” and “death of”, phrases to “Jesus”. Also Jesus has been described as “witness”. It is quite evident that this exegete is based on the belief in second coming of Jesus for which no arguments are provided. "Commentators differ on the meaning of this verse, some saying that it means “'believe in `Isa before `Isa's death'." He then cites reports to that effect from Ibn `Abbas, al-Hasan, Qatada, Abu Malik, and others. He further describes: "Others said that it means “believe in `Isa before the death of the Jew or Christian." He then cites reports to that effect from Ibn `Abbas, Ubay, Mujahid (Tafsir 1:180-181), `Ikrima, al-Dahhak, al-Hasan, Muhammad ibn Sirin, and others. He also reports another view: "Others said that it means “believe in Muhammad - blessings and peace upon him - before the death of the Jew or Christian." He cites a report to that effect from `Ikrima. Then Imam al-Tabari states that the likeliest view to be correct is: “there is none of the People of the Scripture but he will certainly believe in `Isa before `Isa's death”. Imam Ibn Kathir, in his Tafsīr Ibn Kathir3 also supports Imam Ibn Jarir al-Tabari. Here Ibn Jarir has collected a number of differing opinions about the verse. He reports two different attributions for the phrase “believe in” i.e. “Jesus” and “Muhammad”. But he does not accept the only voice of Ikrama, referring “believe in” to “Muhammad”. He also reports three different attributions for the phrase “death of” i.e. “Jesus”, “Jews” and “Christians”. It must be noted that phrase “people of the Book” has not come under discussion but attribution of the phrase “death of” has created more ambiguity about this phrase, it may refer to “Jews” or “Christians” as well, but not both as is evident from “Jew or Christian”. There is no mention of the attribution of phrase “witness”. After describing all differing opinions Imam Ibn Jarir states his inclination towards “believe in Jesus before the death of Jesus” and considers all the “people of the Book” arbitrarily. Each reported opinion has been supported by the statements of earlier exegetes and scholars only. It is also pertinent to note that there are contradictory reports from Ibn Abbas for the attribution of the same phrase i.e. “death of”. Unlike Ibn Jarir, Jalalayn refers the phrase “believe in” only to “Jesus”. Also contrary to Ibn Jarir, Jalalayn presents only two attributions, rather than three, for the phrase “death of” i.e. it may refer to the “people of the Book” or “Jesus” as well. The reference of phrase “death of” to the “people of the Book” is not supported by any argument but to the “Jesus” is supported by Ahadith about the second coming of Jesus. But like Ibn Abbas it also refers the phrase “people of the Book” to “all Jews and Christians”, without any discrimination of time and age, and also “witness” to Jesus. The last sentence says it all. He does not support any of the stated meanings clearly. It means Syed Maududi is not sure about any one of the meanings stated by him. He confidently refers the phrase “believe in” to “Jesus” but after that there is no certainty. The phrase “death of” may be referred, according to Maududi, to “Jesus” and “people of the Book” equally. There is also confusion about the reference of the phrase “people of the Book”. He says it includes “Jews” and also “possibly” may include “Christians”, but only those among both who would be living at the time of the second coming of Jesus. On the other hand he also supports the reference of “people of the Book” to each and every person among Jews and Christians regardless of time and age. There is no mention of the attribution of the phrase “witness”. Again, these views are based on statements of “Companions, Successors and outstanding scholars of Qur'anic exegeses. Here, too, “believe in” refers to “Jesus” without any second thought and no certain answer for the attribution of “death of”. But here no discrimination has been made between Jews and Christiana as far as “people of the Book” is concerned. Even author goes one step further and finds a way out to include all the “people of the Book” from the times of Jesus to the Day of Resurrection. Here we find some fundamental differences of opinion on the meaning of the verse. All the phrases in question are attributed to entirely different references. The phrase “people of the Book” refers to the “all Jews and Christians of the times of Muhammad”, “believe in” refers to “Quran”, “death of” refers to “Muhammad” and “witness” refers to “Muhammad”. There are two points of fundamental importance about this explanation. One, author has not stated more than one meaning of any phrase. Whatever has been said, no matter authentic or otherwise, is said with confidence. Secondly, we find this tafaseer the first one which explains the verse on the basis of structure of the text and flow of the main discourse. It does not rely on the opinions of earlier scholars or even traditions. Ghamidi’s view is somewhat similar to that of Islahi’s. Like Islahi, he also refers the phrases “believe in” and “people of the Book” to “Quran” and “all Jews and Christians of the times of Muhammad”, respectively. But the phrases “death of” and “witness” are referred to the “people of the Book” and “Quran”, respectively. In short, the attribution of “believe in” to “Jesus” has almost attained a consensus except Ikrama who referred it to Muhammad and Islahi and Ghamidi who refer it to Quran. On the other hand “death of” has always been referred to either “Jesus” or “people of the Book” except Islahi who refers it to Muhammad. The phrase “people of the Book” has been source of much more interpretations. 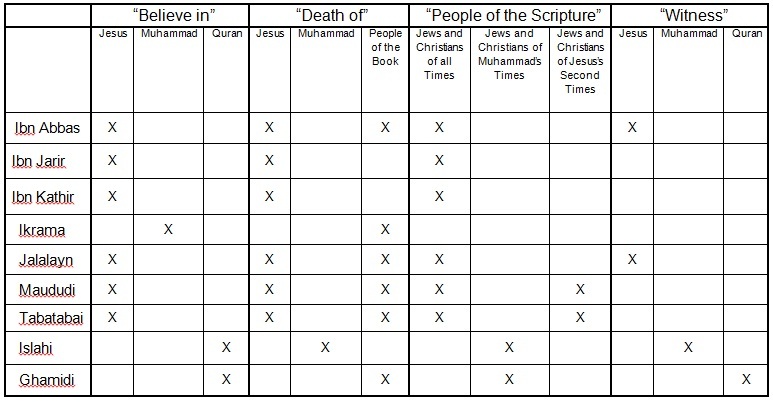 Its attribution varies from “Jews only”, “Jews only living through the times of Jesus during his second coming”, “Jews or Christians”, “Jews and Christians of all times”, “Jews and Christians living through the time of Jesus during his second coming” to “Jews and Christians of the times of Muhammad”. The uncertainty has no bounds in this regard. A little pondering on the above quoted exegeses and their arguments clearly reveals that whatever has been said is based on some narrations of the former exegetes. There have been only some sayings and traditions of Prophet as the basis to make a choice out of available interpretations. We can see that among all those who referred “believe in” phrase to Jesus, none of them strengthened this view point with arguments. It seems like it has been taken for granted. On contrary, there has always been a difference of opinion about the attribution of “death of” phrase. Here every one has dealt with the topic in length but most of the arguments were sayings of former scholars or some traditions of the Prophet Muhammad. Similarly, the most difficult phrase “people of the Book” has been interpreted in a variety of ways and that too without any explanation. It is pertinent to note that most of the tafaseer have dealt with the issue on basis of belief in second coming of Jesus. If we approach the verse without this belief then situation might be different. The table in appendix summarizes the various attributions of all the concerned phrases of the verse under consideration (due to technical complexities the appendix does not appear in this webpage. It can be found at ISRA website. In the following paragraphs we discuss various interpretations and analyze them. We will also discuss basis and implications of each interpretation. In the first place, if we take the view point that “people of the Book will believe in Jesus", we find ourselves on cross roads. In this scenario we have two living creatures to whom we can equally attribute the next phrase “death of” i.e. “Jesus” himself and “people of the Book.” The dilemma has found its basis to burgeon further. So we can now read the verse in either of the two ways; one “people of the Book will believe in Jesus before the death of Jesus (when he returns again to this world)” and second “people of the Book will believe in Jesus before their death”. In both cases the phrase “people of the Book” (who will believe in him), needs to be restricted only to those (whether Jews or Christians) who shall be present at the second coming of Jesus so that they “believe in” him when he comes again to this world and, also, he can be “witness” for their belief. On the other hand, if we include “people of the Book” of all the times and ages, for both above stated views, then how those “people of the Book” will “believe in” Jesus who will die before or after his second coming. If for the sake of argument, those particular people somehow “believe in” Jesus before their death; even then how Jesus can be “witness” for the belief of those very people if he (Jesus) is not present among them at the time of their “believe in”. This is quite evident from Quran (5:117) when it quotes a conversation between Allah and Jesus on the Day of Resurrection where Jesus says “I watched over them as long as I remained among them.” So he (Jesus) cannot be a witness for the times when he is not present. Therefore, we need to attribute the phrase “witness” to someone (or something) else who (or that) remains present at all the times to be rightly attributed as a “witness”. But the question is who (or what)? We can also interpret the first part of the verse in another way; “people of the Book will believe in Muhammad", we again find ourselves on cross roads. In this scenario, too, we have two living creatures to whom we can equally attribute the next phrase “death of” i.e. “Muhammad” himself and “people of the Book.” So, again, we can read the verse in either of the two ways; one, “people of the Book will believe in Muhammad before the death of Muhammad” and second “people of the Book will believe in Muhammad before their death”. In both cases the phrase “people of the Book” (who will believe in him), needs to be restricted only to those (whether Jews or Christians) who shall be present at the times of Muhammad so that they “believe in” him and, also, he can be “witness” for their belief. Otherwise how “people of the Book” who will live after Muhammad will “believe in” him and, in case they “believe in” him, how he can be witness for their belief. Otherwise how “people of the Book” who will live after Muhammad will “believe in” him and, in case they “believe in” him, how he can be witness for their belief for the same reason as stated above for the case of Jesus. To include the “people of the Book” of all times and ages in above stated views, again we need to attribute the phrase “witness” to someone (or something) else who (or that) remains present at all the times to be rightly attributed as a “witness”. But the question is who (or what)? It is interesting to note here that in a few above paragraphs we have discussed all the interpretations, for the reference of all four phrases “believe in”, “death of”, “people of the Book” and “witness”, presented by the traditional scholars [1-6] of the past. Only two contemporary scholars are left to deal with i.e. Islahi and Ghamidi. Unlike traditional scholars of the past and some contemporary as well, who base their interpretations on belief in second coming of Jesus whether derived from traditions of prophet and statements of earlier exegetes or Quran itself, they both base their interpretations on the structure of the text. Therefore, what follows in next, we will mostly discuss the structure of the text and naturally the views of these two scholars will also come under scrutiny. From the above discussion it is clear that we have now reached at a point where we need to search for the attribution of the phrase “believe in” to someone (or something) other than Jesus and Muhammad. In this quest we go back to the text. The pronoun “they” is definitely referring to the “people of the Book” and only Jews can ask of Moses for something. So after establishing the addressees of the Quran here we go through the text. First, the Quran states a demand of Jews that they wanted something other than Quran. But rather than disregarding their thoughtless demand out rightly, Quran quotes some of their demands and crimes, and consequent punishments, from their national history to establish that they have been habitual in such demands and crimes. Also during the course of this crime and punishment story, Quran comments on some of their claims to make corrections. Avoiding the details of their demands and crimes we directly address the issue which is related to our topic. In verses 157 and 158 we can see that, Quran not only refutes (in fact they had neither slain him nor crucified him) their claim but also describes what happened to them in this regard (the matter was made dubious to them) and their actual position (they have no definite knowledge of this matter) on this matter. After that, in verse 158, the truth about the Jesus has been revealed. Here comes the verse 159; “There is not one of the People of the Scripture but will believe in him (or it) before his (Jesus or ‘one’ from “people of the Book”) death- and on the Day of Resurrection he (or it) will be a witness against them.” From verse 160 onwards, again story of Jews continues till verse 161. There are two possibilities here and we will discuss them one by one. In second case, if we consider that deviation from the main discourse, story of Jews, ends at verse 159. Then the phrase “believe in” of verse 159 has three nouns mentioned just before it; facts (one is refutation “neither slain him nor crucified him” and second is “Allah raised him to Himself” i.e. Ra’fa), Jesus and “people of the Book”. If we could prove that Jesus is no more alive, there is no point in believing in him so the phrase “believe in” refers to the facts and the phrase “death of” only refers to the “people of the Book” since there is no other living creature under consideration anymore. Finally we are left with the second part of the verse where only phrase “witness” requires a reference to be decided. Islahi refers this phrase to “Muhammad” and supports his view from within Quran (4:41). As we have quoted Tabatabai in the preceding paragraphs for the reference of the phrase “believe in” to “Muhammad”, also applies here and, therefore, this view cannot be accepted. However, Ghamidi refers this phrase, too, to the “Quran”. But whether Quran can be witness for something/someone or not needs further investigation. Despite some effort, we could not find any such evidence from Quran. From this point we can also find a way to solve the problem of choosing one of the above statements. As we have stated above, if the deviation from the main discourse, story of Jews, ends at verse 159 then verse 159 is not anymore referring back to verse 153 where it discussed Quran and hence, the phrase “witness” cannot be refer to “Quran” since there is no mention of it just before the verse. Also as stated above, the phrase “believe in” of verse 159 has three nouns mentioned just before it. So we can refer the phrase “believe in” to “facts stated about Jesus”, “death of” to the “people of the Book”, “people of the Book” to “both Jews and Christians of the times of Muhammad” and “witness” to “Jesus”. The future work in this regard may include further strengthening of this view by adding further technical investigation of the text, supporting the idea of Quran not being the witness and death of Jesus with arguments. If any one of these does not materialize we must review this view point. “Tanwīr al-Miqbās min Tafsīr Ibn 'Abbās” attributed variously to 'Abdullāh Ibn 'Abbās and Muḥammad al-Fīrūzabādī, translated by Mokrane Guezzou, Royal Aal al-Bayt Institute for Islamic Thought, Amman, Jordan, 2007. “Tafsīr al-Jalālayn” by Jalāl al-Dīn al-Maḥallī and Jalāl al-Dīn al-Suyūṭī, translated by Feras Hamza, Royal Aal al-Bayt Institute for Islamic Thought, Amman, Jordan, 2007. Possible interpretations of the underlined expressions in verse 4:159. ‘X’ indicates the interpretation that is preferred by the personalities in the rows.